If you are a songwriter, singer, band, record company, publisher, producer, or anyone else in the music business that has had a number 1 or number 5 song in the Airplay Express charts you can now purchase a beautiful wooden plaque commemorating your success. But wait! It doesn’t stop there. If you or your friend or loved one is a member of our Hall of Fame in any category you also can purchase an award recognizing your induction on a wooden plaque. 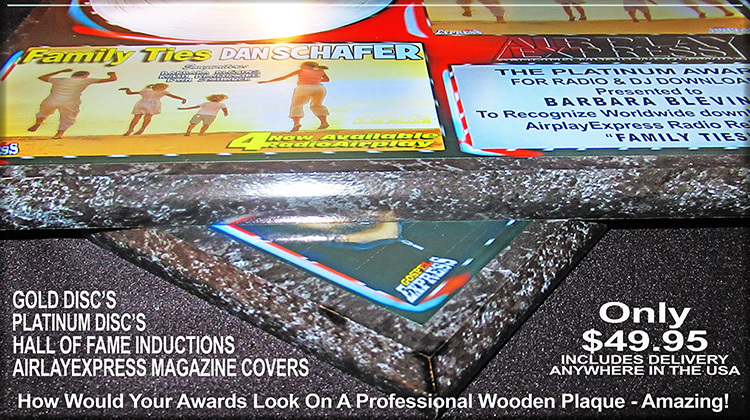 If all of this wasn’t enough to think about, if you have appeared on the cover of Airplay Express magazine you can order a wooden plaque with your magazine cover forever preserved on one of our beautiful wooden plaques for all your friends to see. Email us now and order your Gold /Platinum /Hall Of Fame/Magazine cover now!